According to artistic director Joel Friesch, Visual Concepts recreated the face of each player from the start to get more details to the smallest scar, while rethinking the body system to more faithfully trace the movements of each athlete. The visual improvements also deal with the behavior of the jerseys, whose team has digitized tissue samples to be sure to transcribe the exact color. The "MyPlayer" mode should also take advantage of this eternal race to the detail, since the character creation tool will offer more choices and appearances, especially in terms of hairstyles and morphology. 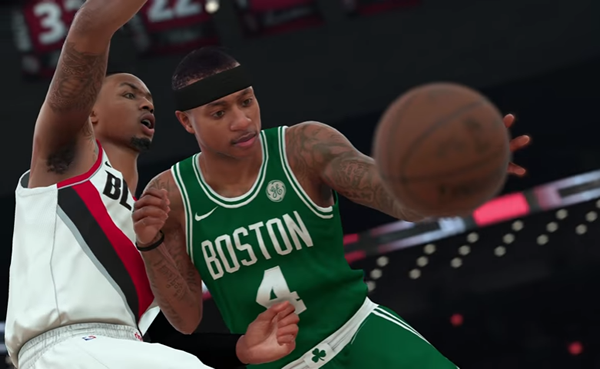 Also note that the NBA 2K18 playable demo will be available on September 8th and will allow, as last year, to enter the career mode of the game. That of the competitor NBA LIVE 18 will be online tomorrow on PlayStation 4 and Xbox One and will also allow To live the beginning of the new narrative campaign with the ability to transfer its progression into the full game. NBA 2K18 and NBA LIVE 18 will be available on September 15th.